Bitter Melon is the English name of Momordica charantia, a climbing vine whose leaves and green fruits, although bitter, has been used to fight cancer, diabetes and many infectious diseases. It is also a powerful weapon against HIV/AIDS since some reports claim that bitter melon has substance Q. It is one of the most favorite vegetables among the Chinese and the most popular herbal tea as well. The fruits and leaves of bitter melon are a good source of minerals and vitamins, such as iron, calcium, phosphorus and Vitamin B. However, it is not known how much nutritional contents can actually be absorbed by the body's digestive system of the plant become some of these substances exist in unabsorbable form. Does bitter melon have medicinal properties? Yes. Books and articles about bitter melon states that the extract from the leaves or roots shrinks hemorrhoids. The juice from the leaves is also good to prevent and lessen cough, for fever and against roundworms. Reportedly, it is also used to treat sterility in women and alleviate liver problems. Likewise, bitter melon has some antimicrobial activity and can help infected wounds. However, none of the medicinal uses of bitter melon has been proven scientifically, although they have not been disproved, either. It's just that it has not been studied enough. Is it true that bitter melon tea and capsules are effective in lowering blood sugar of diabetics? There is one case where it is proven that it can lower blood sugar levels from people suffering from Type 2 Diabetes. Results of these scientific studies that determine the effect of drinking of bitter melon extract on blood sugar level of Type 2 Diabetes have consistently shown that bitter melon lowers blood sugar level. The effect on blood sugar is due to momordicin, a substance that is also responsible for it's bitter taste. The effect of the bitter melon leaves lowering blood sugar level among diabetics is evident regardless of how it is prepared - boiled then eaten, in the form of tea, capsule or tablet. But diabetics should be cautioned about replacing their proprietary medicines with bitter melon teas, capsules or tablets. So far, studies were done only on a very limited number of human subjects so bitter melon and diabetes cannot be labeled conclusive. In fact, no large clinical trial has yet been published on the preparation of Momordica charantia (bitter melon). The manufacturers of bitter melon teas, capsules and tablets themselves are not claiming healing benefits for their products. They market them only as supplements. Are they really good substitutes fot the anti-diabetic drugs that are available in the market? Bitter melon should be considered an addition in the treatment of Type 2 Diabetes Mellitus. It could probably reduce the patients intake of antidiabetic drugs. It should not however, be regarded as a stand-alone medicine. 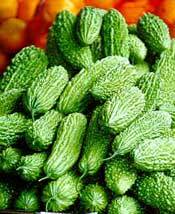 Also, diabetics who want to try bitter melon need not to spend money on the teas, tablets or capsules. They can cultivate or buy the plant from the market and prepare it themselves. Wash and finely chop the leaves. Add 6 tablespoons of the chopped leaves in 2 glasses of water. Boil it for 15 min. in an uncovered pot. Drink 1/3 cup of it 3x a day. Alternately, bitter melon tops can be steamed and eaten (1/2 cup 2x a day).